Tucked away in Winooski, just off Main Street, is one of the state's hidden gems. Vermont Furniture Designs has been handcrafting heirloom quality, hardwood furniture for over 38 years. Working in native walnut, maple, and cherry, each piece is bench made by a small team of highly skilled artisans. Every bed, dresser, and nightstand treated with a sense of pride and a deep respect for the rich history of New England furniture making. Classic, yet elegant styling make their designs timeless. Traditional Mission, Shaker, Arts and Crafts, or Mid-century Modern are all represented in Vermont Furniture Designs vast collection of offerings. Never overly ornate, clean sweeping lines are VFD’s trademark. Rave reviews from across the country have made their furniture highly sought after in Vermont and beyond. 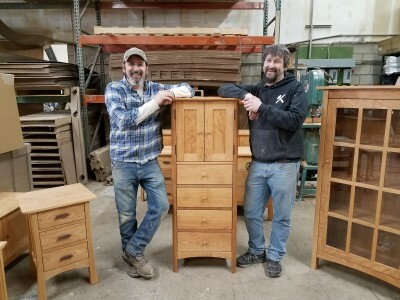 With a combined 44 years of furniture making experience, co-owners Adam Blaisdell and Rob Bachand can be found most days out on the production floor, working alongside the rest of the team. They only break away when the opportunity arises to head up in the showroom and chat with any of VFD’s wonderful customers. Rob and Adam share a passion for designing custom furniture that is both aesthetically pleasing and functionally solid to satisfy a wide range of individual customer wants and needs. Where will Vermont Furniture Designs go from here? Rob and Adam have launched Vermont Handcrafted Furniture! While Vermont Furniture Designs will remain rooted in more traditional fare, Vermont Handcrafted Furniture will embrace other local artisans working in stone, metal, fabric, etc. These collaborations will result in new and exciting designs produced 100% in the Green Mountain State!